Republican presidential candidate John McCain said Thursday he would support the GOP nominee and not launch an independent bid, no matter who wins. "I think it's a legitimate process. I respect it. It's a hard one, but exhilarating," the Arizona senator in response to a South Carolina woman who urged him to run as an independent if he can't win the nomination. Her comments were met with applause. "It's a wonderful experience, whoever the nominee of my party is, I'll support," McCain said. But Pheobe Jolley, a resident of nearby Boiling Springs, warned the senator that if he didn't win, a Democrat would likely get her vote. "I just want you to know you're the only Republican I'll vote for," Jolley said. McCain toured the University of South Carolina Upstate nursing school in this early voting state and continued to highlight his plan to overhaul the nation's health care system to give people more control, encourage greater competition and lower costs. "The problem with health care in America is not the quality, it's the cost," he told a crowded auditorium of mostly students and employees. "More and more Americans are without insurance because they can't afford it. So our job, in my view, is to make it affordable and available, not to have a big government single-payer system." 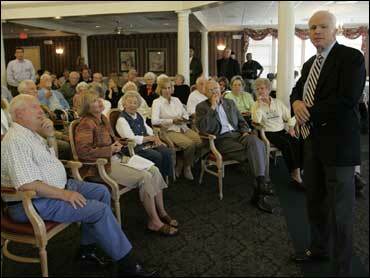 McCain said there is no system in American that can maintain 10 percent annual inflation. McCain continued Thursday campaigning with his 95-year-old mother, Roberta. A day earlier, the 71-year-old McCain, often asked whether he's too old to be president, said he brought her along to demonstrate his good genes.